Hurricane Sandy has slammed onto the eastern seaboard. There’s been widespread damage and flooding across more than six states. There’s been loss of life. But at NASA, researchers are developing a pair of experimental unmanned drones to track future storms in the hope of being better prepared for when they strike. That would be the high-flying Global Hawk, used by the Air Force to spy on insurgents in Afghanistan. But it’s also able to double for hurricane-hunting missions. They can stay in the air for longer than manned flights — up to 30 hours — giving the drones a much larger “window of opportunity” to fly into a hurricane, and can travel much farther and at higher altitudes than manned planes. When NASA flew one of its Global Hawks toward Hurricane Nadine in September, it sent the drone all the way into the eastern Atlantic, much farther out than the NOAA’s WP-3D Orion planes can reach. 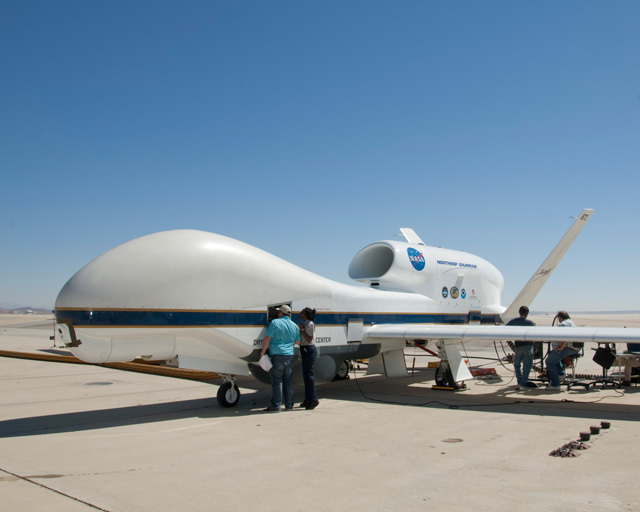 In September, NASA began the first test flights of a pair of Global Hawks in a five-year-mission to track hurricanes and tropical storms, called Hurricane and Severe Storm Sentinel. It’s the first time aerial storm-tracking has been carried out by the drone, which NASA hopes will one day augment manned flights and allow researchers to measure changes in hurricane intensity for much longer periods. But the drones just missed Sandy. “Despite the fact that it was an incredibly busy hurricane season, we happened to hit the lull of season,” says Scott Braun, a research meteorologist and mission director. After concluding tests over the Atlantic that began in September, NASA’s one working drone left its Wallops Island facility in Virginia for the Dryden Flight Research Center in California — for a new round of tests in the Pacific. The other drone never left Dryden due to avionics problems, and neither were in Virginia when Sandy unexpectedly arrived. Still, the project has a lot of potential for tracking hurricanes, Braun says. One of the reasons Sandy is so big — and strengthened considerably overnight Sunday — is due to the storm’s warm air colliding with a northern cold front, referred to as baroclinic forcing in meteorological terms. The two drones are equipped with different sensors. The first packs sensors for sampling environmental conditions around hurricanes. The second is designed to fly up above storms with a variety of instruments to measure the storms themselves; including a Doppler radar, a microwave sounder for measuring temperature and humidity, and a microwave radiometer for measuring surface wind speeds and rainfall. In combination, flying one after the other, the pair of robot storm-sniffers can measure more accurately how hurricanes get stronger. But the drones also have their limitations. Manned planes are quicker and easier to get back into the air afterward than the Global Hawk, partly due to manned flights having larger ground crews. This gives NOAA’s current fleet the ability to do “frequent but short hooks” toward the storms, Braun says. Sufficiently cloudy or foggy weather can also ground the Global Hawk, as a manned observer plane is required to be nearby any drone launches due to FAA regulations. If the spotter plane can’t track the drone, then it can’t take off. More likely, Braun says, is flying a combination of manned and unmanned flights, with each swapping out depending on the environment and distance. It won’t make the storms any less devastating, but it could give a bit more warning.